I love these colors together. Especially the light blue with the orange, greens and pinks. I don't know where my brain was when I was binding the little quilt but all I could think was that I'd love to have these colors as my blog colors ... so perhaps in the next day or so that'll come to be. The quilt ... I shared the top a bit ago ... and now here is the finished product. The pattern is the same as this one. 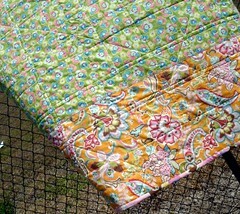 The backside consists of two of the fabrics from the top, as is the binding. 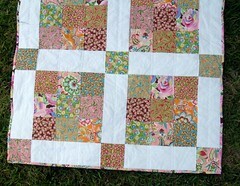 The little quilt measures about 40" by 40" and will be available on etsy soon. In other news I went to the high-risk maternity specialists yesterday (because I'm older than the hills and because I had a TIA during my last pregnancy ... but they were certainly most interested in my advanced maternal age (41) ... bother). They offered all sorts of testing and screening, which I politely declined. My opinion, and Jason seems to agree, is that this is a normal pregnancy, to us, and if an ultrasound or symptom suggests a further problem we'll consider further investigation ... otherwise let's just carry on. The specialists didn't necessarily agree, but were quick to say that that's fine and any testing or otherwise needs to be approved by us and, as the parents, we make the call as to what is and isn't done. That was reassuring, not because I didn't know that, but because I was relieved to not have to argue my case. Anyway, I got a very nice, very long ultrasound full of babe. Lots of kicking, stretching, thumb sucking ... so cool to watch. Everything looked fine and normal. I meet with my regular OB next week, which should be pretty uneventful. How do I feel? Why, thanks for asking. Oh, you didn't ask? Well, I'm a grumpy pregnant woman so I'm going to tell you anyway. My sinuses are driving me nuts, giving me constant headaches, and indigestion is my constant companion, and I don't want to eat much of anything. And I'm tired. And grumpy. Saturday morning I had to move stuff around the garage and felt a familiar pain in my neck, so now that hurts too. Other than that I feel terrific. As much as I don't feel great I know this will all ease up within the next few weeks. So, so beautiful. I am sorry, though, that you are feeling so crummy! I'm sure you are right, though, and that soon it will be nothing but a memory. Sounds like a perfectly normal pregnancy from your symptoms!! I worked in Labor and Delivery for 8 years and I have 8 children. I came to realize moms know and have an instinct about themselves and should be trusted and listened to more. I don't think you are high risk just because of age. They like to call lots of things high risk. It sounds like a perfectly normal baby and mom to me whatever the age! Just came across your blog and love it. I am so sorry that you are feeling yucky...I do remember those days. We are the same age and I have to hand it to you. Congratulations on the new little one coming to bless your life. Take Care. I will popping over again. I feel for you. Take care of you and the little one to be! 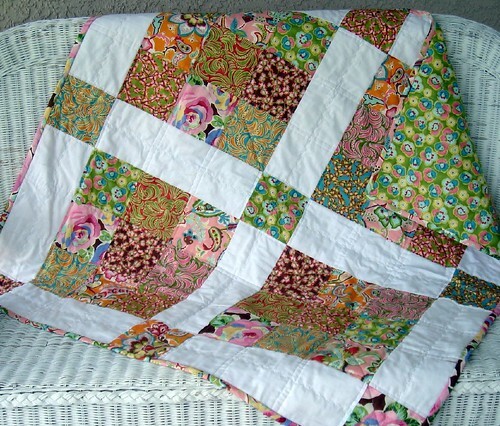 Soak in the beauty of that quilt and feel a bit better! Sorry to hear you are feeling so bad!! Don't envy you on the pregnancy woes - only when you are holding that new baby! The quilt is GORGEOUS! I just can't get over how pretty it is! 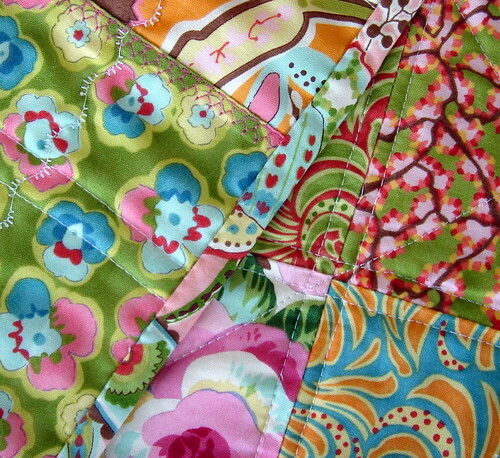 !I love all the different quilting you do to your quilts too! Ok, I've got to be honest. I've never been much of a quilt fan. They just seemed stuffy and old lady. But since I came across your blog I've fallen in love with them! Yours are so beautiful and fun and full of life! 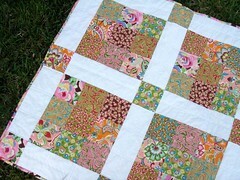 You've made me a definite quilt fan. Almost enough to try one myself. Almost. :) Hope you feel better soon! Are you about at 12 weeks? I can't remember. I LOVE those colors too. Those prints look asian inspired, too! My fave! Nationwide professional award winning Featuring Expert Crafters With One Of A Kind Gifts For The Hard To Buy For Person; Handcrafted Furniture, Flags, Quilts, Gold & Silver Jewelry, Delicious Fudge, Home Accessories, Pet Items, Gourmet Delights And Much More.